The wholesale box quilted bed scarves are over-sized and can double as a throw when unfolded. These scarves/throws have an intersecting 1/2" box stitch quilting pattern. Available for wholesale purchase in your choice in solid colors that coordinate with the Box Quilted Bedding Collection items. 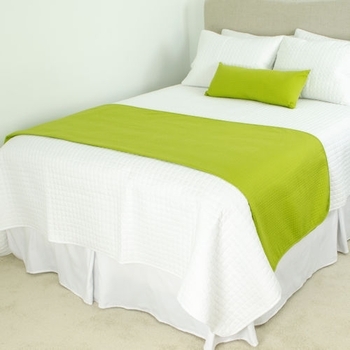 The images show these bed scarves folded 3 times for a modern layered look on the 4 piece coverlet set in white. 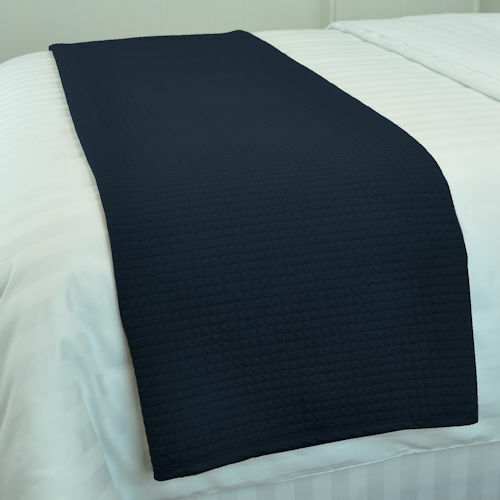 High Quality Microfiber Fabric w/ Polyester Batting - Easy Care, Wrinkle-Free, Machine Washable and Fast Drying. Standard - 56 inches X 88 inches - Fits Twin, Full and Queen Beds. King - 56 inches X 104 inches - Fits King Beds. Standard (56"x88"): Camel, Chocolate (Light Brown), Espresso (Dark Brown), Green Apple, Gray, Khaki, Moss Green, Nautical (Dark Navy), Pink, Purple, Red Apple, and Teal Green. King (56"x104"): Camel, Espresso (Dark Brown), Green Apple, Gray, Moss Green, Nautical (Dark Navy), Red Apple, and Teal Green.